Looking for his lost fish trap, Ben thinks he sees something dark moving under the water. Is it a creature or only his imagination? Diving into the sea with his friend Sophie, he is amazed to discover a wonderful hidden world - and the rich variety of creatures that live there. "When you see kelp forest under the water and you're looking up, the sun is like the light of the sky: it penetrates the water's surface and shoots rays down as in a rainforest. The forest is very magical and mysterious, and fish appear at times, like birds flying through the trees." 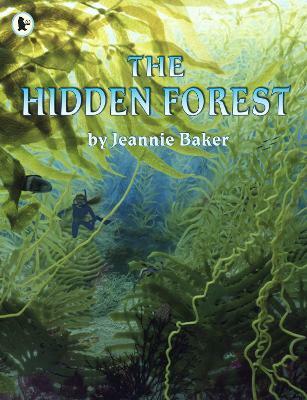 Jennie Baker"
Jeannie Baker is the author and illustrator of a number of children's picture books, including the award-winning Where the Forest Meets the Sea and the critically acclaimed dual language picture book Mirror. Her characteristic use of mixed media to create detailed and elaborate collages is stunning and unique. Originally from the UK, Jeannie lives in Australia. Find Jeannie online at www.jeanniebaker.com.